You can make the cookie dough with a handheld mixer, a stand mixer, or even do it by hand with a wooden spoon. I don't have a handheld mixer and wouldn't have thought I'd ever want one, until now, as I make more small batch recipes. I went with my stand mixer this time even though we're working with small portions here. One thing I did do differently from the recipe is add a spoonful of milk into the dough at the very end. I noticed my cookie dough was dry so I did what I do with my sugar cookie dough to get it smooth and easy to work with - I added just a bit of milk to it and mixed it in. Start with just a teaspoon here and see if you need more. I used about 1 1/2 teaspoon and was rewarded with a very smooth dough. Once chilled, roll them into round balls and toss them in granulated sugar. I felt like I was making Christmas cookies for a minute there! The cookies are ready to be taken out from the oven once set and just starting to crack. They will set up and crack a bit more out of the oven as it cools. ...and great sandwiched with ice cream. I used some homemade vanilla bean ice cream. Any flavor will do, obviously. I also think these cookies would be great flavored with a little peppermint, orange, or almond extract in place of the vanilla. I'll have to try one of those options next time! In a medium-size bowl, beat butter using an electric mixer on medium speed until fluffy, about 1 minute. Add brown sugar and beat for another minute. Then add egg yolk and vanilla, beating until combined. In another bowl, whisk together the cocoa, flour, baking soda, and salt. Add dry ingredients into the wet in two increments, mixing well after each. [*If you find the dough a bit dry like I did, add a teaspoon or so of milk and mix until just combine into a smooth dough.] Cover the dough and chill for at least 1 hour. Preheat oven to 350 degrees. Line a cookie sheet with parchment paper or a silicon mat. Place granulated sugar into a small bowl. Divide dough into 8 equal portions and roll each in the palm of your hand to form round balls. Roll each in the sugar to coat. Place onto baking sheet, evenly spaced apart. Bake for 8-10 minutes, or until cookies are set in the center and just beginning to crack. Remove from the oven and let cool on the cookie sheet to give it a chance to firm up. Then remove cookies onto a wire rack. If making ice cream sandwiches, place a generous mound of ice cream on top of the flat side of a thoroughly cooled cookie. 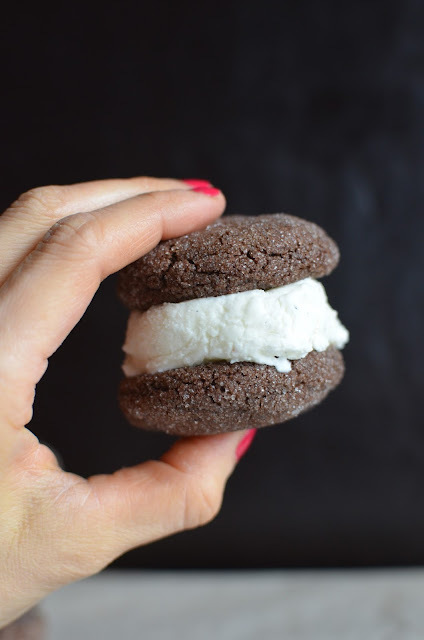 Place a second cookie, flat-side down, on top of the ice cream and gently press together. Wrap each ice cream sandwich in plastic wrap and place in the freezer to set. I love the sugar on the outside of these, they sound delicious. 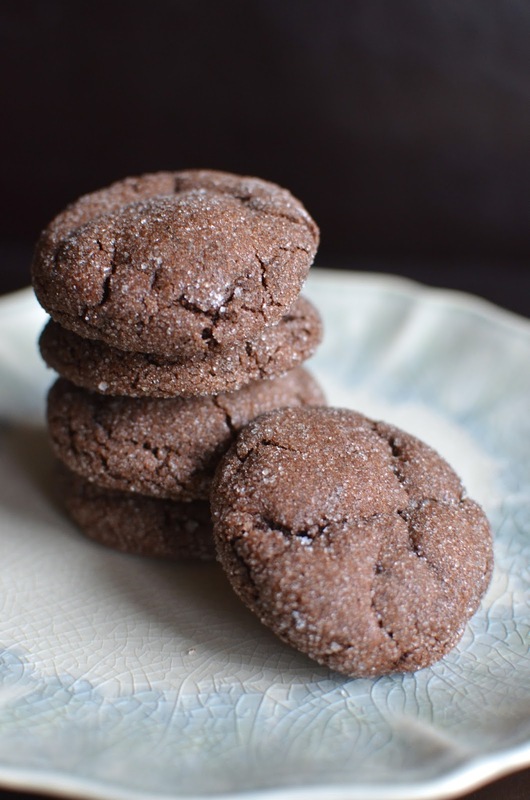 I love the small batch baking - and love the idea of a soft chewy cookie with lots of chocolate flavor. With ice cream - oh yes please! I like how the cookies are still soft in the center as ice cream sandwiches. Enjoy the rest of the week! Wow Monica, these would be great in the freezer...especially with the Summer approaching...I love the small bite size...thanks for the inspiration! They look so cute and delicious Monica :-) Loved it! Thanks - really fun and easy to make. My daughter would seriously love these. I feel as though I know your daughter a little bit...my kind of gal. They must be very delicious with vanilla ice! Hi Monica, normally it's just me and my husband, love the idea of small batch baking. For some reason I'm not getting your emails again, will re-subscribe. It's been sort of crazy warm by us these last few days (it was almost 90 yesterday! too hot for march!!) and I could definitely have used one of these guys! Love the small batch idea since it's just my husband and I at my house! These look amazing!! I love biting into a soft, chewy cookie. 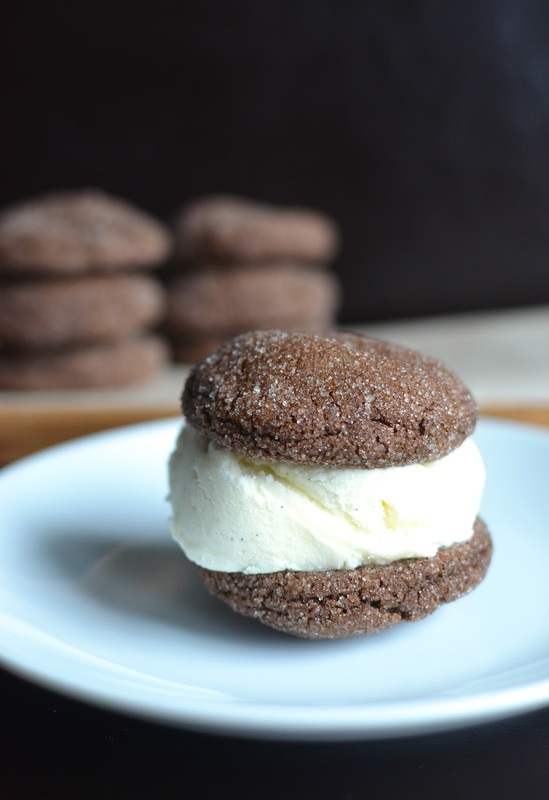 What a great idea to turn them into little ice cream sandwiches! I am so in awe of your dedication to small batches, Monica. I am more inclined to double a recipe than half it! That's why I need sources to "get rid" of what I bake! Oh these cookies look wonderful, Monica! I love the sparkle of the sugar coating; it kind of reminds me of snickerdoodles but in chocolate cookie form. Sounds delicious!